Who’d have thunk it? A few years ago — okay, a bit more than a few — when I first came to Basel, foods common in other European countries, none of them particularly challenging (lamb, seafood), were hard to find. The only fish routinely available was farmed trout or Eglifilets/filets de perches. As for anything vaguely ethnic, forget it. Fast-forward and the picture has changed out of sight. Manor, Globus and many of the larger supermarkets have, gasp, fine lamb racks trimmed to within an inch of their lives and a good selection of saltwater fish and shellfish, while speciality ethnic food shops have sprung up all around. Even Coop and Migros have coconut milk, Thai curry pastes, rice wrappers and tortillas (though you should give those corn ones a wide berth aaaaaaaaaaaaaaaargh). For more adventurous stuff, like when I want to try out something from David Thompson’s Thai Food, David Chang’s Momofoku, Atul Kochar’s Indian Essence or Sue Style’s Mexican Cookbook ;-), all I have to do is dart into A Chau near the station, Aggarwal on Claragraben, El Sol in Bachgraben or Scatola on Nadelberg and I’m sorted. 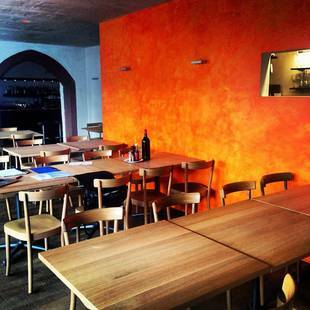 And there’s good news too for anyone who can’t cook/won’t cook: there are more and more restaurants serving plausibly good ethnic food in and around Basel. I was reminded just how far we’ve come when I looked in on the English Show (Radio X)Saturday to do some pre-records on new/fun places to eat in our three-corner neighbourhood, with the lovely Anna Wirz, who now fronts the show. Listen out for them on upcoming shows, Tuesday nights 6.30-8 p.m., 94.5 FM, and streamed live (or download the podcast). 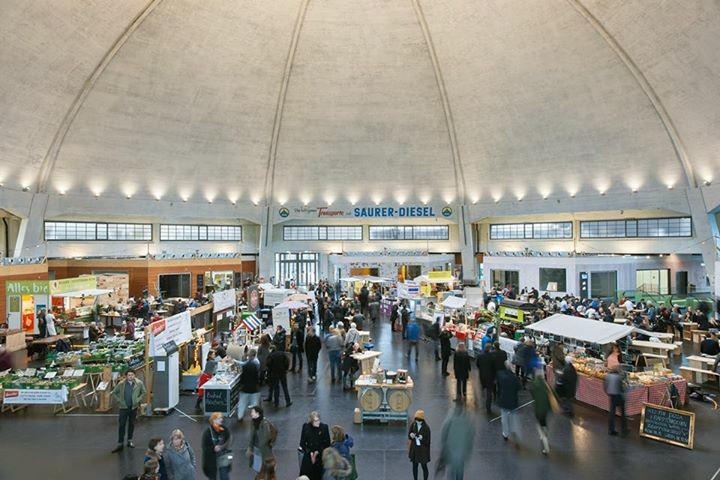 One of the most fun places to open recently, which we covered in a recent show, is the so-called Neue Alte Markthalle situated inside the big domed hall close to the station. It was once Basel’s wholesale veg. market, then (briefly) a doomed shopping centre, and now – hooray – a sort of Singaporean food court à la baloise. When you walk in either from the A Chau side or from down below on the Viadukt and up the escalator, your nostrils are assaulted by a rich medley of fabulous Asian/Indian/Middle Eastern smells. In the centre are stands selling Indian, Thai, Italian, Lebanese and Persian and vegan food – there may be others I’ve forgotten; go and see for yourself. You stand in line for whatever has caught your eye (or nose), then take your plate and settle down at one of the tables spread out around the outer edges of the market. It’s packed at the lunch break (lots of offices nearby) so go early — 11.30 or any time after 1, though you do run the risk that your fave Thai curry, tagliatelle with truffles, biryani, korma or pilaff is ausverkauft/sold out. Stop press: they now do a night market (Nachtmarkt) on Thursdays, Fridays and Saturdays from 5pm until 2am (till midnight on Thursdays). 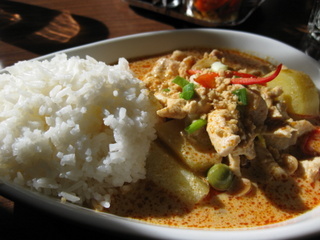 If it’s Thai food you’re after, try Restaurant Nordbahnhof on Mülhauserstr. 123. Owned by a Swiss-Thai family and staffed by family members, this is a typical Quartierbeiz, i.e. local pub/friendly neighbourhood resto, in the heart of St Johanns Quartier. Forget the décor (if you could call it that ): it’s very brown and rather dark. You’re here for the food, right? This is pretty authentic though doubtless toned down a bit (as are most ethnic foods when they stray beyond their own borders) to suit Swiss tastes. It’s also very fairly priced: their lunch menu — soup and a choice of two mains (usually either a curry with meat or tofu and a veg-rich stir-fry with meat or tofu), with coffee or tea thrown in — will set you back CHF18. I could have done with a bit more feist to my chicken in red curry/coconut milk sauce with Jasmine rice, but the chicken was moist, the rice perfectly fluffy and the overall result pleasing. My friend (discerning, adventurous, eats out a lot) loved her stir-fried beef with loads of crunchy-cooked veg., noodles and bean shoots. We both agreed that fried tofu (small pieces had strayed into the soup) tastes just like bits of old mattress…or like how we imagine bits of old mattress, the foam rubber kind, might taste. Nice smiley service by one of the brothers (the other’s in the kitchen). There’s also a big terrace for when summer comes around again (it will, it will). 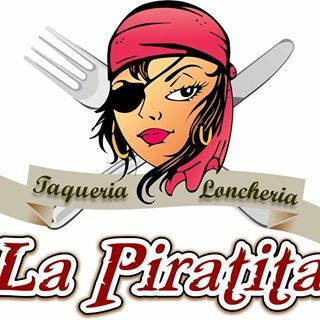 La Piratita on the corner of Hegenheimerstrasse, just across from the Felix Platter-Spital. Remember that great little shack/pop-up place near the University Hospital, painted in glorious technicolour? 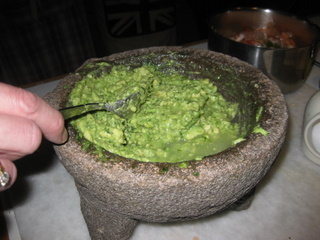 Mexican owner and cook Berenice Amstutz has now moved out here and is doing a good job. This is the real McCoy, none of your crispy cardboard taco shells or chilli con carne, just the kind of Mexican dishes you’d find in a neighbourhood taqueria in Mexico’s Calzada de Tlalpan. I’m not sure if they’re doing lunch at the moment, but if so, expect a daily special and few tacos/burritos. Evenings there’s a longer menu and Friday night is buffet night, complete with mariachi music by a guy in the regulation black and silver kit, equipped with one of those hats you see people wearing as they emerge, sunburnt and giddy, from planes from Cancun. 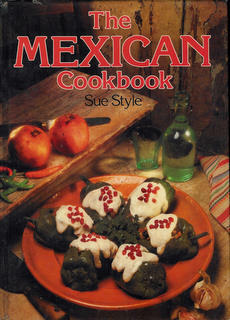 The tortillas (from El Sol), soft, fine and supple, are worth a detour alone – take one out of the basket, fill it up on the hand with whatever is your chosen meat- or fish-in-sauce (Berenice does a mean mole), roll it up and eat it in your fingers, sauce dripping out the bottom. There’s a good range of Mexican beers (Negra Modelo entre otras) and tequilas forever, plus killer margaritas. Another favourite of mine is one that’s also just moved house: Jay’s Indian Restaurant, modestly subtitled “Coolest Indian restaurant in Switzerland”, which recently decamped two doors up St. Johanns Vorstadt to the atmospheric, über-old Ackermannshof (the core of the building is 12th century). Owner Jay Kumar hails originally from Bangalore and describes his cooking as “international Indian”, fusing elements from both South India and Europe. His new hangout is resolutely modern and self-consciously trendy with pared-down décor, bright orange/coral/yellow colours, taste-packed food and a good buzz of happy punters. At lunch it’s all about simplicity and speed, with meat, fish and veggie options from CHF19-30. Evenings are more leisurely with a bit more choice. Jay believes that wines from the more aromatic spectrum work well with Indian food and offers interesting options to prove his point (a white Rioja from Spain, a red Garnatxa/Syrah blend from Priorat), including some by the glass.